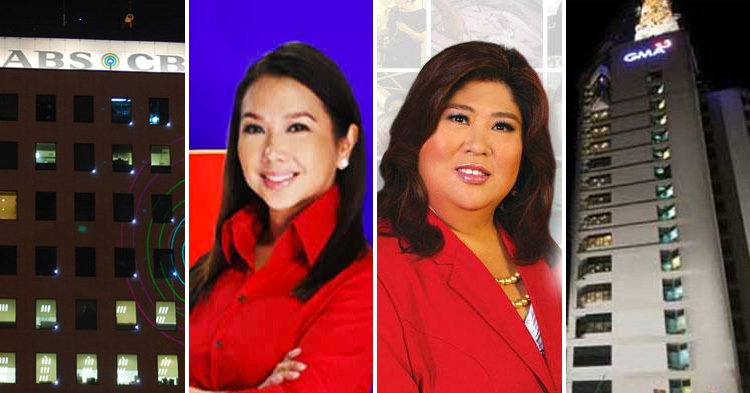 ABS-CBN again led across all survey rankings but GMA7 was able to fill in more slots in AGB's board. 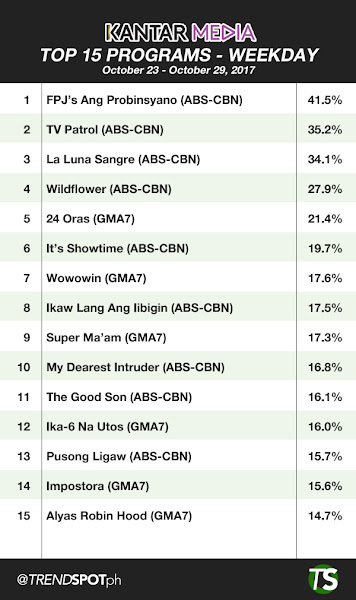 Tabulated data from October 23 - 29 showed FPJ's Ang Probinsyano still leading the pack on both AGB Nielsen and Kantar surveys. 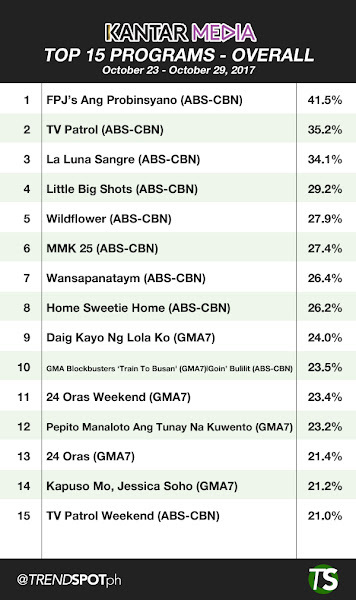 Ang Probinsyano topped Overall and weekday ranking on both survey firms with 41.5% (Kantar) and 12.7% (AGB) average ratings for the week. For weekend, the 2 survey firms are split as Kantar reported Little Big Shots on top with 29.2% and AGB Nielsen puts Daig Kayo Ng Lola Ko in the number 1 position with 12.5% ratings. Biggest gainer this week was GMA Blockbusters which featured Korean horror suspense movie Train to Busan. 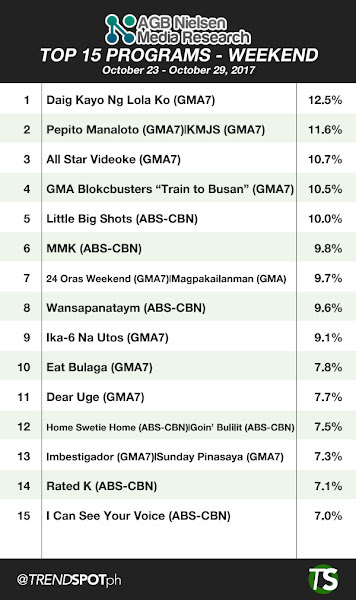 GMA Blockbusters landed in the number 4 spot of AGB's Weekend rankings and number 7 in the overall rankings with 10.5% ratings. Kantar Media, on the other hand, reported Train to Busan in the 6th spot of the weekend rankings and 10th overall with 23.5% ratings. 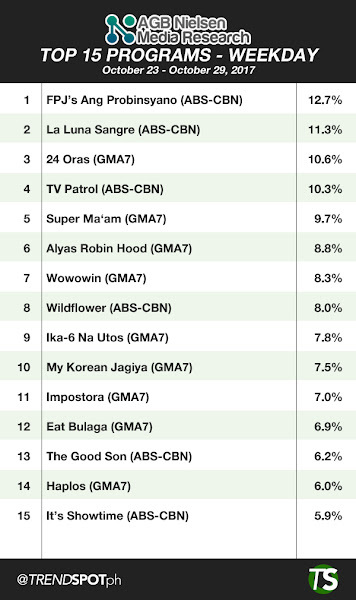 ABS-CBN still dominated Kantar with 10 our of 15 programs in the leader's board while GMA7 swarmed AGB Nielsen's board with 11 programs in the top 15 led by Daig Kayo Ng Lola Ko which fell in the 2nd spot of overall ranking following Ang Probinsyano. 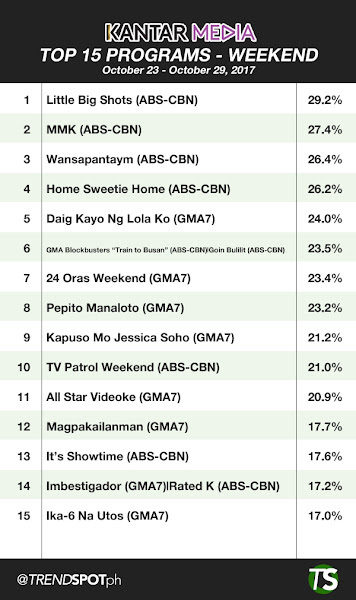 Meanwhile, here are the top 15 programs for the week of October 23 to 29 on both Kantar and AGB Nielsen TV surveys.